The prequel to the series finale will be available to view on this site (www.bbc.co.uk/doctorwho) after the next episode of Doctor Who finishes at 7.45pm on Saturday, 11 May. You'll also be able to watch it from that time through the BBC's interactive Red Button service. Written by Doctor Who's lead writer and executive producer, Steven Moffat, the intriguing prequel is called She Said, He Said and stars Matt Smith as the Doctor and Jenna-Louise Coleman as Clara. 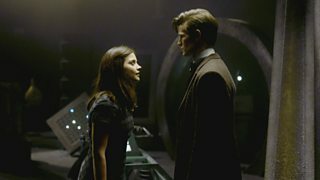 It's one of the show's longest prequels and explores how little Clara knows about the Doctor... and vice versa. The Crimson Horror: Tomorrow at 6.30pm.